Evoking the heady scents of leather and tobacco, Cuba Brown is the ideal scent for the mature man who knows what he wants from life and is not afraid to go after it. This casual fragrance possesses a distinctive blend of woodsy notes with just a hint of jasmine and bergamot. First introduced by Cuba in 1997, this men's cologne offers a unique fragrance that is perfect for daytime wear or a casual evening on the town. Cuba Brown was indeed a pleasant surprise. I normally purchase Cuba Gold but this is a subtle yet interesting and positively adequate change. As with Gold it is not overpowering nor long lasting but woody and warm in it's own way. Just the right amount of citrus, a great 2nd choice. Because of this I may try other Cuba fragrances as they must all be slightly interesting in their own respect. 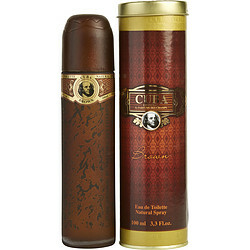 Cuba colognes offer the best value of any colognes. I use most of them and I am constantly getting great comments. Would highly recommend. You do not have to spend a fortune for great smelling men's colognes. Tried a sampler of Cuba fragrances and this is their best. It is a good all around fragrance. Awesome inexpensive cologne for men! This is an incredibly versatile fragrance. It has a very sophisticated scent which is very moderate and not too overwhelming. I find my self wearing this scent almost everywhere. i would recommend Cuba Brown and Cuba Gold to those who can't decide on what one to get.